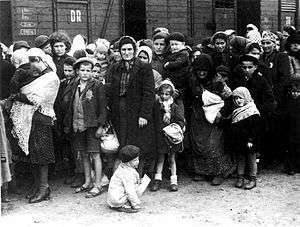 The Budapest Ghetto was a ghetto where Jews were forced to live in Budapest, Hungary during the Second World War. The area consisted of several blocks of the old Jewish quarter which included the 2 main synagogues of the city, the Neolog Dohány Street Synagogue and Orthodox Kazinczy Street Synagogue. The ghetto was created on 1944 November 29 by a decree of the Royal Hungarian Government. It was surrounded by a high fence and stone wall that was guarded so that contraband could not be sneaked in, and people could not get out. The Nazi occupation of Budapest (Operation Margarethe) started on March 19, 1944. The ghetto was established in November, 1944, and lasted for less than three months, until the liberation of Budapest on January 17, 1945 by the Soviet Army during the Battle of Budapest. As with other ghettos that had been set up in other parts of Nazi-occupied Europe the area was completely cut off from the outside world: no food was allowed in, rubbish and waste were not collected, the dead lay on the streets and piled up in the bombed-out store fronts and the buildings were overcrowded, leading to the spread of diseases such as typhoid. More than half of those that were forced into the ghetto in 1944 were sent to concentration camps, starting almost immediately from the establishment of the ghetto. From occupation to liberation the Jewish population of Budapest was reduced from 200,000 to 70,000 in the ghetto, and about 20,000 housed in specially marked houses outside the ghetto having been granted diplomatic protection by neutral politicians, including Raoul Wallenberg, who issued Protective Passports on behalf of the Swedish Legation, and Carl Lutz, who did the same via the Swiss Government. Of those that were deported (most of them to a concentration camp on the Austrian border), the vast majority were liberated by the advancing Red Army. 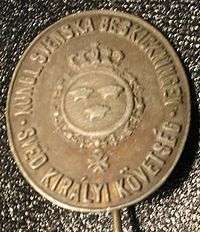 Károly Szabó an employee on the Swedish Embassy in Budapest attracted exceptional attention on December 24, 1944 as Hungarian Arrow Cross Party members occupied the Embassy building on Gyopár street. He rescued 36 kidnapped employees from the Budapest ghetto. This action attracted Raoul Wallenberg's interest. He agreed to meet Szabó's influential friend, Pál Szalai, a high-ranking member of the police force The meeting was in the night of December 26. This meeting was preparation to save the Budapest ghetto in January 1945. Pál Szalai provided Raoul Wallenberg with special favors and government information. In the second week of January 1945, Raoul Wallenberg found out that Adolf Eichmann planned a massacre of the largest Jewish ghetto in Budapest. The only one who could stop it was the man given the responsibility to carry the massacre out, the commander of the German troops in Hungary, General Gerhard Schmidhuber. Through Szalai, Wallenberg sent Schmidhuber a note promising that he, Raoul Wallenberg, would make sure the general was held personally responsible for the massacre and that he would be hanged as a war criminal when the war was over. The general knew that the war would be over soon and that the Germans were losing. The massacre was stopped at the last minute thanks to the courage and daring action of Wallenberg. The last remaining section of the ghetto wall was demolished in 2006 during construction works. It was situated in the backyard of a building (No. 15 Király Street) and was originally an old stone wall made use by the Nazis in 1944 adding a line of barbed wire. The walls of the ghetto were typically older structures found on the area. A memorial wall was erected on the place in 2008, using some original material, but not matching the exact details. ↑ For a detail map see US Holocaust Memorial Museum. ↑ Decree On the Establishment of the Budapest Ghetto at the Jewish Virtual Library.